This article is part of an ongoing series called “Socialist faces in high places” looking at the left in relation to the electoral path and state power. 2016 is shaping up to be a year of social movements: Black Lives Matter, trans-equity, teachers and workers struggles. It is also an election year, and one candidate, Bernie Sanders, has activists and organizers across the country “feeling the bern.” But is the enthusiasm justified, will electing good politicians lead to substantial change? “The question is,” according to Kshama Sawant, Seattle’s socialist city council member, “How can we build a public movement that would counter business opposition?” This was Sawant soon after her historic victory where she and her party, Socialist Alternative, defied expectations and won a tight race against an entrenched incumbent Democrat, Richard Colin. Her major legislative agenda, “$15Now,” a substantial minimum wage hike for workers, faced hostility from business interests. Sawant recognized that they couldn’t do it alone, that it would take a movement of regular people to make change. But how far did the minimum wage law go given the tremendous support Sawant’s campaign generated, and did her repeated electoral success help build social movements as she often claims? This article wants to go back to Sawant’s central question posed in 2014 – how can we build social movements to counter business power? While Sawant and Socialist Alternative claim they are building a movement, they are instead building a candidate at the expense of building a movement. When labor groups backed a watered down version of the Seattle minimum wage law, Sawant and her party followed suit because they had no independent power from which to win a stronger bill. The result is that Sawant’s most recent re-election campaign represents the politics of business as usual, with Sawant advocating business friendly reforms like commercial rent control in order to secure political support and win reelection. Sawant’s political career shows that pushing candidates without building social movements will fail to win substantive change. As activists and social justice organizers consider working on electoral campaigns in 2016 we should reflect on the pitfalls of an electoral strategy. Sawant’s political career is illustrative. 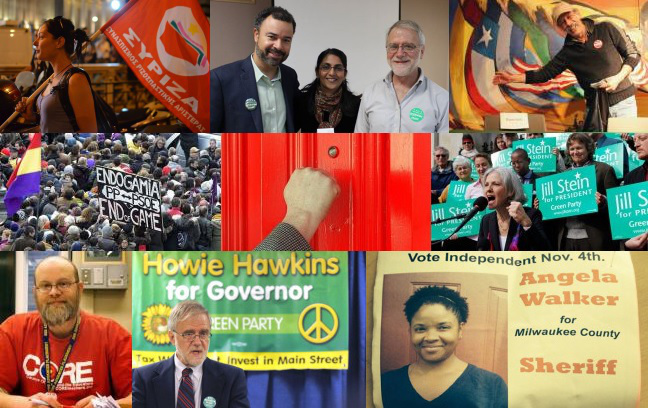 Image captured from Left Elect (www.leftelect.net) which describes itself as “a national network building the future of left independent politics” and brings together a spread of left groups, individuals and candidates to promote left involvement in electoral politics outside of the Democratic Party. Note that Kshama Sawant appears top center and top left is a Syriza activist in Greece. The image has since been removed. Sawant’s career begin in the streets, with Occupy Wall Street where she was at numerous general assemblies, protests, and demonstrations. Just months after the Seattle encampment was broken up and abandoned, Socialist Alternative ran Sawant for the state legislature. Her campaign slogan, “a voice for the 99%,” attempted to build on the popular momentum coming out of OWS. After the collapse of Occupy, Sawant’s campaign manager Ramy Khalil explained their strategy: “Socialist Alternative argued that the movement could be rebuilt by running 200 independent Occupy candidates across the country.” Sawant’s personal assistant, Ahn Tran, framed the strategy as a question, “We thought: Why not Occupy the elections?” SA seemed to miss a major point of the anti-electoral OWS movement. Nonetheless, from here they would go to build Sawant’s political career on the victories of movements. But the key to Sawant’s campaign victory in 2013, as opposed to the previous year, was support from the labor movement. In her first campaign against Chopp, Sawant and SA raised an impressive $21,000, mostly from small contributions. When she ran against Conlin in 2013 major labor unions backed her. A look at her contributors shows that, on the second campaign, big unions gave big and gave early; SEIU Local 6, PTE Local 17, SEIU Local 1199NW, Teamsters Local 117 and IBEW Local 77 all maxed out their allowed contributions at $700. (All told candidate Sawant raised a whopping $161,023 for the campaign). Sawant also won significant endorsements from major local unions including AFSME Local 1488, AFT Local 1789, IBEW Local 46, and CWA Local 37083 and the Seattle local of the APWU. Union support like this is more significant than just the dollars collected, union endorsements come with staff, voter drives, phone banking and mailers. Why did unions turn to support Sawant? Largely for their own reasons. In 2013 they were engaged in a major battle with area businesses in the city of SeaTac, a bedroom community of Seattle and Tacoma and the site of the area’s major international airport. The crux of the battle was the fight to increase wages for workers at the airport to $15 an hour. SIEU 775, the union leading the effort, decided to run a ballot initiative to force employers to grant a wage increase (companies are still fighting the outcome in court). Meanwhile, in Seattle itself, other unions were moving forward with the audacious fast food workers campaign, staging one day strikes and media events to build support for a $15 an hour wage increase for fast food workers. These were the two major campaigns for the labor movement in Seattle in 2013; Conlin would do them no favors, and Sawant became their candidate. Her major campaign plank became the $15 minimum wage, rather than a party for the 99%, and it defined her candidacy and reflected the interests of her backers. Sawant and SA’s great success is that they dramatically changed the climate of politics in Seattle. With Sawant, “$15” became locked in as the legislative agenda for the new city council. She told the UK Guardian, “The public battle on $15 an hour, that number, has been lost by business,” she said. “Now the fault lines have gone to: I support 15 but we have to do it thoughtfully.” The question before Seattle was what would the final legislation look like? How good would the law be for Seattle’s working families? Sawant and her allies pushed for “$15 now,” an immediate across the board increase with some costs offset for small businesses (but importantly small businesses were included). In this way, Sawant’s legislative agenda was akin to the measure just passed in SeaTac, won through a massive organizing campaign. In addition to providing for paid sick leave, measures to promote full time employment and that tips and service fees go to the workers, the SeaTac law mandated immediate $15 an hour wages for airport workers and yearly cost of living increases. The SeaTac measure was far more direct and effective than what would pass in Seattle. The Seattle law is a complicated mess of exemptions and extensions. The biggest compromise came when Sawant and SA agreed to define a small business as one employing 250 or fewer employees. That limit was extended to 500 in the final law. Further, a complicated timeline of implementation and exceptions was incorporated. If the employer is a “small business” they have a lower rate to pay; if they provide health care they have a lower rate; if the worker receives tips, the employer pays a lower rate. As of now, spring of 2016, the minimum wage rate in Seattle is $13.00 an hour for large employers with no payments toward medical benefits, $12.50 for those large employers who do. It is $12.00 an hour for “small-businesses” that don’t pay either an equivalent $1.50 toward medical benefits or in which an employee receives an equivalent $1.50 an hour in tips. For the small employers that provide either of those services the city minimum wage is $10.50, just .75 cents higher than the state minimum. Some of the schedule increases don’t complete until the year 2024. In the campaign, Sawant herself spoke out against machinations like this. In the $15Now campaign launch party in January of 2014, Sawant explained that “when we say minimum wage, we mean all workers. A universal minimum wage is what we are fighting for.” She warned that corporations and businesses were already building opposition to the bill, and that they were talking about a phased-in plan over “many, many years,” adding that what owners wanted was to “do it in such a way that it takes 10 years to get to $15. Then it’s meaningless.” She said that with the decline in value of the minimum wage over decades, that workers have “already been phased into poverty; we don’t need any more phasing in.” Referencing the efforts in SeaTac she argued that there were “many not-so-small businesses, parading as small businesses,” trying to water down the bill, and she noted that some of the same businesses that vigorously opposed the SeaTac measure were placed on the Seattle Mayor’s committee to develop a bill. As was Sawant. Her critiques were prescient – So why did everything Sawant warned against come to pass? 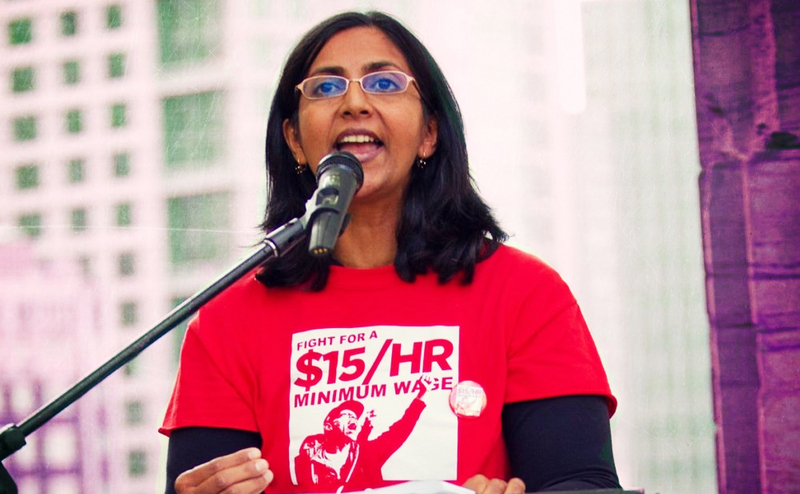 Why was the minimum wage bill so weak, given all the support Sawant’s candidacy generated? In the wake of Sawant’s election victory, the new mayor, Ed Murray, quickly put together an “Income Inequality Advisory Committee.” The committee included Sawant and major representatives of labor, but also representatives of the city’s major business interests, like the city Chamber of Commerce and the Capitol Hill Chamber, the downtown Hotel Association, the hospitality industry, senior executives at banks, and other business owners. Importantly, the main union representative was Dave Rolf, a leading reform figure in labor politics, who advocated a style of “entrepreneurial unionism” whereby unions and progressives “should take a cue from business” and run their organizations like Silicon Valley startups. His union, SEIU Local 775NW, backed Sawant’s opponent, Richard Conlin. Rolf was co-chair of the mayor’s committee. Rolf was a major author and vocal supporter of the final compromise. Rolf told the media, as paraphrased in Al Jazeera, that “he stood by the ‘delicately constructed’ deal.” When even more changes were made, adding a “training wage” and weakening enforcement, Rolf sent an email to Al Jazeera saying he “fully supported” the further compromises. But the referendum never got off the ground; Sawant and SA abandoned the whole effort. Once Rolf and the unions came out in support of the compromise, Sawant and SA were the only organized group in favor of a stronger bill. As a small left party they didn’t have the organizational heft to actually take a referendum to the people of Seattle and get it passed. That would take canvassers, phone-bankers, funds, ads, and well, a movement. The major institutional backers of her election campaign, the unions, had pulled back, and she couldn’t move forward without them. Sawant’s election was made possible by the labor movement, and her legislative victories and defeats are also explained and defined by the role of the movement. 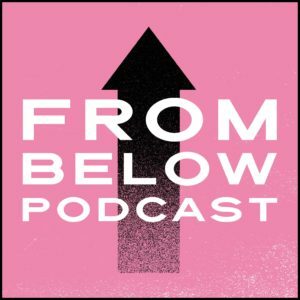 Instead of building an independent base of worker support that could either push for a stronger measure through demonstrations and direct action, or through an organized get out the vote effort in favor of the referendum (like what happened in SeaTac), Sawant and SA built a political career rather than a movement. And they were stuck. When the city council passed a horribly watered-down measure Sawant sheepishly argued it was the best that was possible. This was the same position her opponent, Richard Conlin, argued six months pervious during the campaign. A similar story can be told with Sawant’s recent legislative efforts and her bid for reelection. In 2015 Sawant was the big money candidate. She broke fundraising records for Seattle city council races, and outspent her opponent, Pamela Banks of the Urban League, $419,000 to $330,000. At one point during the campaign Sawant had more campaign contributions than any other politician in the city. And once again, money came from unions, this time, from major local unions, their members and leadership. Sawant’s reelection issue was residential rent control, something critically important in Seattle. Unfortunately she was outmaneuvered on the city council by her chief political opponent, Tim Burgess, chair of the council. Burgess orchestrated a vote that put the council on record supporting residential rent control. In Washington, any municipality that passes rent control needs to have those laws cleared by the state legislature. The Seattle city council vote meant that Sawant would have to lobby and cajole state legislators in Olympia. While potentially beneficial in a long-term struggle for affordable rent, this would do nothing for the short-term goal of getting re-elected in Seattle. Sawant abandoned the effort. Here Sawant teamed up with Seattle businessman and “establishment power broker” Dave Meinert to push for commercial rent control. Meinert, who opposed Sawant’s “$15 Now” effort and was on the committee that created the mayor’s compromise measure, has a lot to gain from commercial rent control. Most of Meinert’s main businesses are in the Capitol Hill neighborhood where rents are skyrocketing. And he is no small fry; he has “his hands in nearly every line of business” including, a record label and artist management company, a number of restaurants and bars including The 5 Point Cafe, Lost Lake Cafe, Big Mario’s New York Pizza, The Comet Tavern, Grim’s, is the founder and co-owner of the yearly “Capitol Hill Block Party,” and owns an events and promotions company. The reality is that in her bid to win re-election, with no social movement to back her, Sawant turned to established sectors of power to win support. In her fist election this included unions, but in 2015 favored business interests like Meinert’s. In this sense Sawant is representing the business interests of boutique business owners, against another segment of local capital, commercial landlords, with nary a worker to be found. This is business as usual politics, with one segment of business using elected representatives to foist their interests over other segments of business – casting deep shadows on society. Passing a $15 minimum wage in Seattle would not have happened without Sawant. The point is not to disparage her; it is likely that Sawant is genuinely interested in furthering the cause of working people in Seattle and believes in the electoral process as a path of effective change. Our question is why wasn’t the effort for $15Now able to achieve more? The answer lies in the campaign’s overall strategy of pushing forward a politician, rather than building power of popular forces. When Sawant says one thing, and does another, when she runs on a particular platform, and then helps to implement policies supported by her opponent, she is reflecting the realities of state power and elected office. Pushing candidates without social movements that can make them do the right thing is a failed strategy. It has failed in Greece with Syriza, in France with Francois Hollande, and in Seattle with Kshama Sawant. And, although exciting, it will also fail with the Bernie Sanders campaign in the unlikely event he is elected. Putting politicians before movements leaves elected officials, no matter their intentions, alone in a wilderness of business power. This is why the OWS movement and the BLM movements are anti-electoral. They’ve learned the lessons of social struggle from history. The legacy of Dr. King is a case in point. King knew the importance of keeping his efforts focused on movements of resistance, rather than running for or holding office. To get the Civil Rights Act he marched on Washington, to get the Voting Rights Act he helped build a movement in Selma. Our own moment is marked by movements demanding and winning real social change. The BLM movement, immigrants’ rights, trans equity, and workers movements are all having dramatic impacts. Chicago teachers are striking for a “millionaire’s tax” in their city. Seattle teachers are boycotting onerous and wasteful standardized tests. We should look here for hope. We don’t have to look to socialist faces in high places for our answers. We are generating them anew all the time. Michael Reagan is a historian and community organizer based in Seattle, Washington and this article originally appeared in Counterpunch. ©2019 Black Rose Anarchist Federation / Federación Anarquista Rosa Negra.